AFTER A SUMMER WHICH SAW $150 MILLION INVESTED IN PLAYERS LIKE DION WAITERS, JAMES JOHNSON, KELLY OLYNYK, THE HEAT NOW FACE THE GRIM REALITY THAT THEIR FUTURE SUCCESS WILL BE DEPENDENT ON HOW THEIR YOUNG PLAYERS DEVELOP. The Heat put themselves in an incredibly difficult position this past summer, investing big money into older players who made sudden, drastic improvements in contract years and a culture that wasn’t enough to make the playoffs in a depleted East. With the startling lack of cap flexibility, there is increased pressure on young guys to become featured rotation players and potentially more. Here’s how they’re holding up. At one time in his NBA career, Winslow was one of the up and coming players in the Association. Fresh off an excellent year at Duke and a top seven selection in the lottery, Winslow stepped in the 2015 playoffs, flashing a key role player floor and superstar ceiling. Fast forward to 2017-2018 and it’s clear he has hit a point of stagnation. He has been a glaring negative for Miami whenever he reaches the floor by most advanced metrics and his presence on the court actively hurts the system Coach Erick Spolestra has installed offensively. The Heat system is predicated on spacing to open up driving lanes for ball handlers like Goran Dragic to get into the lane and kick or take it to the hole. The main drawback with Winslow has always been an inability to shoot from three and when he is on the floor, defenders can sag off and provide more help on the drive. For example, on this play here, Rudy Gay is able to completely ignore Winslow and trap Dragic on the baseline, forcing a turnover. Plays like this are common when Winslow is on the floor because of the absolute lack of defensive attention he commands off the ball. Granted, he has been shooting better from three thus far in the season, but expecting that trend to extend to a full season is a fool’s errand–let alone garner attention from defenses. 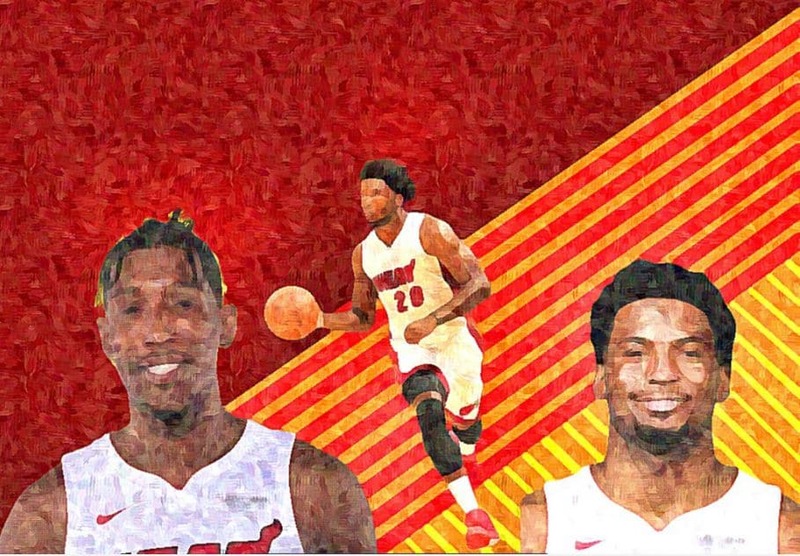 Already this season, when Winslow is on the floor, the Heat have failed to even sniff an average offense and his impact has been so outspoken that even his defensive acumen hasn’t been enough to overcome measly offensive output. Winslow still has high potential but whether he can reach it will be vital to the success of the team as a whole. Josh Richardson is one of the most underrated young players in the NBA. Through three years, he has functioned as an above average 3&D wing on an average team and has consistently had a positive impact on the Heat. Richardson may not be a foundational piece for the future, but if the team needs to rebuild he will certainly hold a lot of value, whether that be as a trade piece or complementary player a la Gary Harris or Robert Covington. Granted, he is on a big contract and his injury history is dicey at best, but in a heavy workload this year, he has performed admirably and the Heat have been .7 points better with him on the court thus far. He still needs to prove he can shoot at a league average clip from three at the minimum, and improve his playmaking. Even if he doesn’t, he can still provide a positive impact on both ends of the floor.